I have been looking for a pair of riding boots forever but haven’t found the one that I really like. They are either too big for my calves or not comfortable. I finally found my perfect pair at Colehaan outlet. These boots are available in black, brown and sandshell. I called the store the day before and had the brown ones on hold. At the end, I brought the sandshell home with me instead of the brown ones. One of my goals this year is to try new things and not buying the same stuff over and over again. This time I was able to force myself buying something different other than black and brown. This color is not something I would typically buy and it’s not something I already had in my closet. I wasn’t sure if I am going to keep them or not but the color is growing on me. As far as comfortability, there is no doubt that Colehaan makes the best shoes. These are 100% real leather. They run a bit narrow so I went up a 1/2 size. As you can see from the photos, they fit my calves quite well. I really like them and I know I will get tons of wear out of them. You always look so chic and put together in your outfit photos! I agree with Jess. You look very chic. : ) I think the boots and the colour look great on you, but I probably wouldn't get that colour for myself because I don't think it would suit me. I love the color of the boots! I bet the color will get more beautiful with more wear. You look very cozy and casual in this ensemble. I like the color you chose and would have had a hard time debating between brown and this color for riding boots. The side view of the calves does look great! How do you like the F21 skinnies? Another blogger (9 to 5 chic) raved about them a while back and I was interested in trying them before I became obsessed with Gap. @PetiteAsianGirl I think I made the right choice for getting this color instead of the brown ones. I do like F21 skinnies. The quality isn't super great or anything like that. But for the price, I think they're great. The thing I like the most about these skinnies is they come in 28 inches which is a perfect length for me. You should give them a try. Your boots look fantastic! I love the pale camel color! Wow.. Great boots! I love how they fit the back of the legs. I would've picked a cognac color but that's just me! Sydney those look amazing on you! And I really like the colour you chose too. You look snazzy, Sydney. I love the color of these boots. Is the sweater the one I tried on and thought was too big on me, and it fit you just right? I'll be darned. It does fit you perfectly. Nice pictures. I noticed that you have blush on, very pretty. @Vicky Yup, it was the one you tried on and thought was too big. Sz XS regular fits me pretty well. Gap is still having these sweaters in stores. Thanks for noticing my blush. It is Rock & Republic pressed blush in tease. I love it so much. One sweep goes a long way. Thanks to Jean for the recommendation. I really like the color of these boots and think they're a good change to the typical brown and black. and they will still be just as versatile as brown boots but add a bit of variety. i'm really loving them and they fit your calves so well! btw, you look so lovely in your pictures! i love this outfit and the sand color boots. this is definitely something i'd wear! everything fits you so well. those boots are a really interesting colour. i'd try pairing it instead with something super bright like red. on the other hand, i adore the fit of that sweatshirt! i love the sand color! it's a nice departure from the cognac boots i usually see. Oh those boots are gorgeous! Love that color. Oh you lucky girl!!! I could have sworn I posted a comment and now I don't see it!! Strange!! These look really good on you and hooray for trying new things. I've been looking for the perfect pair of brown riding boots for myself too and it looks like the search continues. Thank you for suggesting the 6pm website to me in earlier comments. I didn't end up buying anything there but its good to know other sources for small sized shoes. Thanks! I love this look, camel against dark denim is hot! And you look so beautiful. I love your blog! You look amazing! Those jeans fit you PERFECTLY! I think we are close to the same size. I'm going to look into those skinnies! :) And the boots! They look GREAT on you! I love your whole outfit! mmm...why have I not seen this background before? I'm a fan. More outfits w/this background please. I would not think to get a riding boot in this color, but even I was surprised at how much this color appeals to me. You do often see Cognac around. Sand is such a good alternative! LOVE those boots!! I wear riding boots all the time in the fall and winter and now they are pretty much all I reach for on the weekends. Those are so cute in that light tan color! you look great! and i think the color of the boots are very refreshing. if my nine west boots don't work out, i think i'll have to get those in black! (hopefully my outlet has them). You look soo very well put together Syd! I love the boots but I gotta say, I am in search of exactly that sweater you are wearing so I'm glad you posted this - its beautiful! p.s. can't wait for you to share what he built when you were dating! 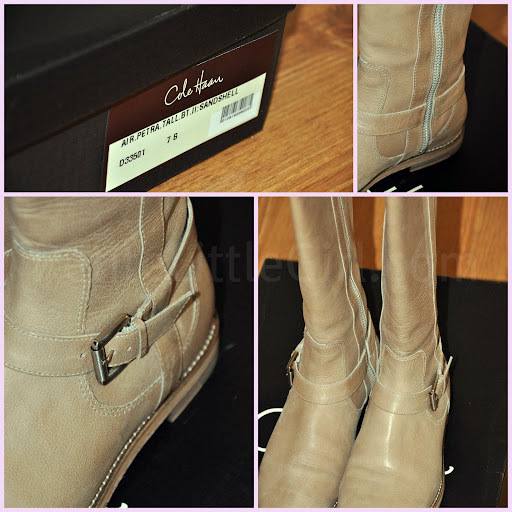 I love these boots (and they are such a neutral, they're sure to go with everything)! The color is very similar to the ones I bought this season from F21 (but yours are much nicer). Great outfit! I completely lucked out when I was visiting relatives in the US a few years ago – I discovered that slim calf boots seem to be slim enough in the calf for my ‘solid’ legs. I only bought one pair – I wish I’d bought more, then i came to know about it's online order/delivery services & I'm happy to see that.